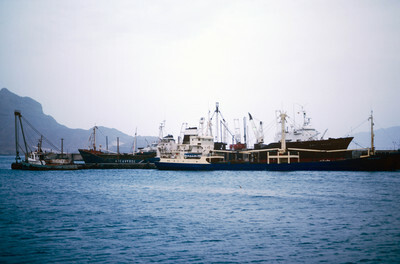 Cargo and fishing vessels docked at Porto Grande, the country's largest port. Porto Grande is located in Mindelo. Porto Grande is used for imports but also as a storage port for visiting vessels. It was equiped with a fish freezing plant a few years before this photograph was taken. In the background, the mountainous terrain of São Vicente juts into the horizon.